I Love This Book. There, I’ve said it. Yep, I am totally and completely biased when it comes to Naked Calories. This book is all about how the simple foundational elements of fresh foods can bring us back to health without drugs, doctors, or contrived diets. In essence, it is a prescription for how to live a truly healthy life. This book (and the authors’ relationship) began when Mira was looking for ways to correct her debilitating early onset osteoporosis. She was a beautiful young woman who looked perfectly healthy on the outside, but was struggling on the inside – like so many of us. I don’t talk about my own situation often, but I have my own medical challenges, which include Crohn’s Disease. For those of us who appear normal but aren’t it is a constant frustration that no one believes us when we say we don’t feel well, so I could easily relate to Mira’s situation. Once Mira’s condition was reversed – you read that right, she was able to completely reverse her extremely advanced osteoporosis by changing her eating habits, adding supplements, changing poor lifestyle habits and adding weight-bearing exercises – the Caltons set out to prove that what they had accomplished with Mira could be extended to other conditions as well. They believe that it is possible to slow down, stop, or even reverse advanced stages of disease without medications. They spent six years touring the world, researching the effects of modernization on the lifestyle and nutrition habits of various societies. They were looking for a correlation between modernization and disease. They visited the peoples of Tibet, Peru, Papua New Guinea, China the outback of Australia and the hidden regions of the Amazon focusing on primitive cultures to evaluate their nutrition. They visited more than 100 countries on all seven continents in their research. What they discovered was that in these communities everything revolves around the tribe or clan. Their individual survival is dependent on the overall health and productivity of the group and everyone works for the betterment of the whole. They eat as their ancestors did for thousands of years, hunting, fishing, foraging, growing and trading what they need. And of course their diets consisted of seasonally fresh ingredients that were never processed. In these primitive areas they never once encountered obesity, unfit bodies, or even much tooth decay. And fascinating to me was the fact that those tribes that primarily consumed protein and fat through hunting or fishing (animal products) were leaner and taller than those who received their protein primarily through plant-based diets. As they moved into areas that were slightly impacted by modernization, the incidence of diabetes, obesity, heart disease, and cancer were all becoming standard physical conditions. And when they returned to urban life all the “modern” diseases were rampant. They have found that even with the advent of prescription drugs and following western medical dictates, people continue to die of cancer and heart disease and the diagnoses of diabetes and obesity keep rising. Naked calories are what most people fill their diet with – everything that fills us up without any nutritional value. These are foods and beverages that have been stripped of their essential vitamins and minerals. Whenever you choose prepackages processed foods and take-out over homemade foods, you run the risk of eating filling but nutritionally void meals. Micronutrients are vitamins, minerals, EFAs and accessory nutrients. Macronutrients are carbohydrates, fats, and proteins. The book takes us through the process of understanding first what nutrition is utilizing a series of simplified scientific explanations that anyone can understand – even me! – and then through the steps to living a healthier, more nutrient-rich life. It ends with a chapter dedicated to their “Hypothesis of Health” which touts the advantages of living as a nutrivore (avoiding nutrient-poor foods) and the ways to accomplish this lifestyle. Each section is sprinkled with “Naked Facts” which highlight the chapter’s main points. They are a great way to reinforce lessons we can learn. For example, in the chapter “Everyday Micronutrient Depleters” Naked Fact #5 is: “Global distribution, factory farming, food packaging, and preparation methods can cause large percentages of micronutrients to be depleted from your food before it reaches your plate.” This is followed by a list of five ways to maximize micronutrient values. As many of you know if you’ve been reading my blog, Facebook and Twitter postings I hate the use of high fructose corn syrup (HFCS) and avoid it whenever possible. In addition to the presence of high levels of mercury in many commercial samples, HFCS (unlike regular sugar) suppresses the secretion of leptin, a hormone that tells your brain that you are full. And if that wasn’t enough, it also elevates triglyceride levels, which can lead to an increased risk of heart disease. Naked Calories explains all of this and much, much more, making us smarter consumers. I learned so much while reading this book that I kept a highlighter next to me and used it extensively. For example, if you lust for sweets you may have a magnesium deficiency and if you crave salty foods (like I do), it may be because you need more calcium in your diet. Just think how much better we could feel if we were armed with this information! This book is incredibly comprehensive and contains so much information that it is impossible to highlight it all in one review. Suffice it to say I strongly recommend that you order Naked Calories immediately and start to read through it. You may discover that medications your doctor has prescribed might be doing additional harm and before you reach for over-the-counter meds, you may want to stock up on nutritional supplements to counteract the possible depletions. 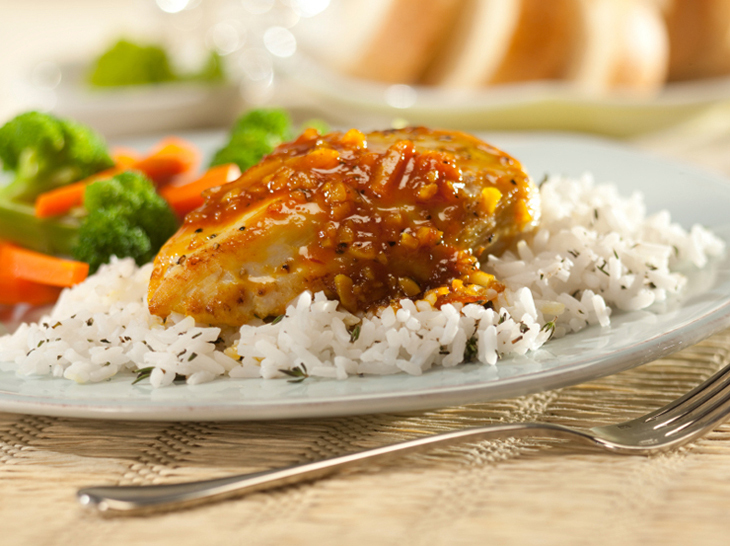 In honor of the concepts in Naked Calories, here is one of my favorite healthy recipes, pan-seared chicken served with a rich and bright orange and shallot sauce. YUM! Note: I received a complementary copy of Naked Calories for review purposes. Pounding meats, in this case chicken, helps even the thickness of each piece, helping all parts cook in the same amount of time. If you have ever had a chicken breast where the flat portion was horribly overcooked and tough, that could have been minimized if they had taken the time to pound the chicken first. Prep the Chicken: Place one of the chicken breasts inside of a freezer-style resealable plastic bag. Using the smooth side of a meat mallet, lightly pound the fatter part of the breast to even out the thickness. Repeat with the second breast. In a small bowl, combine the cumin, yogurt, and thyme, stirring until well blended. Add the chicken, turning to coat thoroughly. Cover the bowl and marinate the chicken, in the refrigerator, for 1 to 2 hours or up to 6 hours. Remove chicken from the refrigerator and take out of the marinade, wiping off excess marinade. Discard marinade. Set chicken aside to warm up to room temperature, about 20 minutes. Make Orange-Shallot Sauce: Combine the stock, orange juice, and wine in a medium saucepan and cook over medium-high heat until reduce by half. Add the honey and shallots, stirring until honey is dissolved. Continue cooking, stirring occasionally, until reduced and slightly thickened. Remove from the heat and whisk in the butter if desired. Keep warm while you cook the chicken. Cook the Chicken: Combine orange zest with 1 tbsp of the olive oil in a small bowl; set aside. Season both sides of chicken with salt and pepper to taste. Preheat a skillet over medium-high heat. Add the remaining 1 tbsp of oil to the hot pan. Add the chicken and cook on the first side, without touching, until golden brown, about 2 minutes. Using tongs, flip the chicken and baste the top with some of the orange-oil. Cook until slightly firm to the touch and cooked through, another 2 to 3 minutes. Flip back over and brush the second side with the remaining orange-oil. To Serve: Set a chicken breasts on warmed serving plates. Top each with a little of the Shallot-Orange sauce, garnish plates with orange slices, thyme sprigs, and rice, if desired. Serve immediately. Interesting. I will have to explore further the idea that a sugar craving may indicate a magnesium deficiency. I will go take a look at Naked Calories on Amazon. Tammi – I hope you do get the book. There is sooo much in it that can help all of us live better, healthier lives! !